The Pushpaka took off and turned north. When it rose, there was great commotion on the ground; Vanara hordes raised thunderous shouts of 'Jai' - "Victory to Rama, Victory to Sita, Rama and Lakshmana". Inside the Pushpaka, there was a high throne charmingly carved and designed. Sita and Rama took their seats on it. They then appeared to all as cloud with a lightning flash resting on the Sumeru Peak. Rama drew the attention of Sita to the battlefield below, and said. "Here is where Lakshmana overpowered and killed Meghanada [RRV2-8b]". He also showed her other spots associated with similar exploits and victories. He showed her the bridge [RRV2-7a, 7b] that the Vanaras constructed across the sea, and described to her the heroism, devotion and faith of the Vanaras. Very soon, the aerial chariot reached the Dandaka Forest. Rama had the vehicle land before the hermitages of Agastya [RRV2-1] and other sages. With Sita and Lakshmana, and other members of his entourage Rama visited the holy sages, paid reverential homage to them, and after taking leave of them, he ascended the Pushpaka again, and reached the Chitrakoota Hill [Photo of Chitrakoot]. There too, he offered prostrations to the sages, and soaring to the sky again, he showed Sita the City of Kishkindha [RRV2-4a] from the chariot itself. Even while the Pushpaka was speeding fast, Rama indicated to her the sacred rivers Yamuna and Ganga. 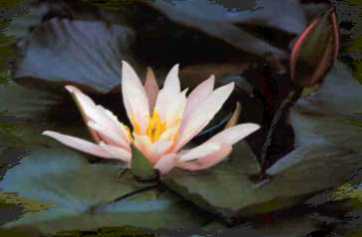 Sita offered worship to the holy streams in her mind. Soon, they could see the thrice-holy Prayag, where the Yamuna flows into the Ganga. They could get a far glimpse from that position of the splendorous City of Ayodhya itself. The chieftain of the Nishada tribe, Guha, [RRV-14] who was yearning most ardently for the return of Rama, his brother and his consort, espied the Pushpaka in the sky; he fell flat on the ground in grateful obeisance, the very moment he saw the vehicle. And, lo and behold, the Pushpaka landed just then at the very place. Guha ran forward and fell at the feet of Rama. Tears streamed from his eyes; he could not contain his delight; he rose and embraced Rama in the ecstasy of his heart. Sita, Rama and Lakshmana conferred their blessings on the tribal chieftain. They took their bath in the sacred river and ordered Guha to bring the ferry-boat for them to cross the Ganga. The Pushpaka, which belonged to Kubera, before Ravana appropriated it, was sent back to its original owner. One more day remained to be spent, outside Cities, in exile. Therefore, Rama commissioned Hanuman to change himself into a Brahmin and proceed to Ayodhya. He was to inform Bharatha the news about Rama and others, and bring back from Ayodhya news of Bharatha. Hanuman left immediately. Rama, with Sita and Lakshmana, and all who had come with him, moved into the hermitage of Bharadwaja [RRV-15] and accepted the hospitality and gratitude of that sage. Hanuman found the residents of Ayodhya lean and famished, despondent and depressed; they had not relished food or drink during the absence of Rama. All over the town, one could hear their grievous groans and wailing. No one could move towards another to console or nurse, for everyone was too weak to take a few steps nor had anyone the desire or the capacity to nurse or console. But, rays of hope had already been cast by the news he was bringing. Bharatha had some welcome premonitions of the happy event; his right eye twitched and his right arm too. He anticipated the receipt of the good news of Rama's entry into Ayodhya. He was grieving that one more day was still to pass before the period of exile would end. He was worried that Rama had not sent anyone to communicate to him which place he had reached. He told himself how fortunate Lakshmana was, since he was all the time in the presence and serving the Lotus Feet of Rama. "The Lord cast me into this City, for, I am a hypocrite. My Lord is all softness and sweetness. He is the kind kinsman of the downtrodden and the fallen. He is compassion itself. He will certainly arrive tomorrow", he consoled himself. Just then, Hanuman was within his sight as a Brahmin, come with tiding. Hanuman was thrilled at the condition of Bharatha. His body had been very much reduced; he was worn down by anxiety. His hair had become matted. His eyes had become perennial streams of tears. He was repeating the name of Rama without intermission. Hanuman was full of joy at the sight of such a dedicated soul. The hairs of his body stood on end because of the ecstasy. His thoughts ran in several directions. But, he remembered his mission and poured the nectarine news he had brought into the thirsty ears of Bharatha. "Bharatha! The person from whom you have been separated and for whom you have been pining without sleep or food all these nights and days, whose virtues and powers you have been extolling and reciting every moment of your life all these years, who has guaranteed safety to the gods and security to the sages, who fosters truth and righteousness in all the worlds - He, Rama, has achieved victory over all enemies, and the gods are singing his glory". Just as a man suffering from acute thirst is rendered happy at the sight of water, Bharatha was filled with joy when he listened to Hanuman. He wondered whether he was actually listening to some one actually speaking to him. But, he assured himself that it was true. "How can this be an illusion? Who is this person who has brought the good news? Where did you come from? ", he asked the visitor, embracing him out of sheer gratitude. Hanuman replied, "O Bharatha! I am Hanuman, the son of Vayu, the Wind-God. You seem to have forgotten. I am the Vanara who fell on the ground, before you, while I was carrying the Sanjeevi Hill [RRV2-8a]. I am a servant of the Lotus Feet of Rama." Hearing this reply, Bharatha rose most respectfully and was overwhelmed with joy; he bowed his head in reverence. "O Leader of Monkeys! You have demolished my sorrow. Your very sight has ushered calm in my mind. Ah! How fortunate am I! 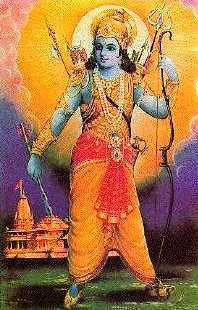 I could see a Messenger come from Rama today!" He continued to repeat the same sentiments for a long time. "Is my Rama hale and happy? My mother, Sita, how is she? Hanuman! How am I to express my gratitude to you? What shall I do for you in return? I cannot find anything of equal preciousness which I can offer you in gratitude. So, I will ever remain indebted; I do not know how to repay the debt, or with what. Where is Rama now? At which place is he staying? Relate to me the exploits he fought unto victory", he said, with unbearable eagerness. Hanuman was struck by the devotion and dedication that Bharatha evinced and he fell at his feet to demonstrate his admiration. He said, "Bharatha! Rama is very near the city of Ayodhya itself. You can see him within a short time. His achievements are indescribably wonderful. You know this. He too was constantly remembering you. The Lord of the Worlds, Rama, has said out of his own mouth that in the whole world there is no brother equal to you in purity of heart, sharpness of intellect, and equipped so fully with all the virtues. How can those words be negatived?" Bharatha was overcome with delight when he heard these words. "Has Rama spoken of me thus? O! How fortunate am I!" he cried and embraced Hanuman fondly. Hanuman declared that he could not delay any longer; he took leave of Bharatha and reached the Presence of Rama. He informed Rama about all that he had seen and heard. Now, Bharatha started preparations; he seldom put both his feet down at the same time on the ground! He was ever on the move, most busy. He arrived at Ayodhya from Nandigrama and offering prostrations to the Preceptor, Vasishta, communicated to him the news of Rama entering Ayodhya soon. He rushed into the Queens' apartments and announced to the three mothers that Rama, Sita and Lakshmana were arriving. The mothers rose quickly and were filled with joy. Bharatha ordered that the entire City be informed of the good news through all media. The news reached all ears with lightning speed. Children, the aged, men, and women ran helter-skelter shouting the news at the top of their voices. Bharatha collected the sages, the scholars, the preceptors, the leading citizens and the four Sections of the Armed Forces, and with the three Queens and Ministers led by Sumantra, he walked forward with Satrughna by his side to meet Rama. Rama, while nearing Ayodhya, was describing to the Vanaras and others around him the beauty of the City: "O Sugriva, Angada, Vibhishana! Ayodhya is a holy City. It is a beautiful City." In the midst of Rama's enthusiastic description of the City's charms, Bharatha appeared at the head of the Armed Forces and with his brother and queens. As the ocean heaves up in joy at the sight of the autumn moon the vast populace heaved a breath of joy at the sight of Ramachandra, Rama the Moon. Their excitement reached the sky. The mothers embraced Rama with ecstatic delight and forgot themselves, caught in the flood of happiness. Sita, Rama and Lakshmana fell at the feet of the mothers; the joy of both parties knew no bounds. Rama drew Bharatha near him and, pained at his weakened frame, he consoled and counseled him lovingly. He praised aloud his brother for his steadfast devotion and affection towards the people. Sita, Rama and Lakshmana prostrated before Vasishta, Jabali, Vamadeva and other sages, as soon as they were sighted. Even the most ascetic among the sages could not restrain his tears at the happy reunion with Rama. The Vedic scholars raised their voices to the sky and showered their blessing in traditional formulae: "Live victoriously for hundreds of years. Live prosperously for hundreds of years". Bharatha and Satrughna fell flat on the ground before Rama in reverential homage. Though Rama pleaded with them again and again to rise up, they found themselves unable to rise and leave hold of the Lotus Feet. Lakshmana and Rama had to exert jointly to lift them. The brothers embraced each other in fervent affection, and shed tears of joy and relief at sight of each other's faces. The delight with which their minds were filled gave their innate beauty a rare splendour. They shone like embodiments of physical charm. The sadness of separation gave place to the joy of togetherness. They were now deep in the ocean of bliss. Sugriva, Nala, Nela [RRV2-7a] Angada, Hanuman and others assumed beautiful bodies for the festive occasion. The citizens were overjoyed at the sight of the entourage of Rama. They extolled in various ways the austerities that Bharatha went through and welcomed the result thereof. They appreciated his sterling virtues. Rama admired the faith and devotion of the people of the City. He gathered around Him the Vanaras and Vibhishana; he introduced them to his brothers and his preceptors. When he took them near the queens and told them, "These are my mothers", all of them fell at the feet of the women, saying, "O, how fortunate we are. We see the mothers who gave birth to God Himself. You are indeed most worthy of worship. Bless us most graciously". Kausalya addressed them thus, "O Vanaras! You are all as dear to me as my son Rama himself. May Rama never forget you; may He ever protect you". Then, deliberating among themselves, they ascended the chariots brought for them and entered the City. In front of every home were placed golden pots filled with auspiciously coloured water. Flags were tied across the streets and on houses. The faces of the people, which were faded and shrunken with sorrow, like lotuses in moonlight, blossomed into freshness and beauty, like the same lotuses at sunrise, when Rama came before them. Their countenances shone with attractive effulgence. The sky resounded with their cheers and shouts of Victory. The chariot which bore Rama entered the city streets. The streets were bursting with excitement and delight. The auspicious flames of the lamps that were held by devoted hands and waved as he passed, shone like stars and gave the impression that the firmament had fallen on the earth. The roads were soaked with fragrant rosewater. As the chariot passed, showers of flowers were rained on it by the citizens from the windows and the terraces. The ecstasy of the citizens broke all bounds. With His three brothers and three mothers, Rama with Sita by His side, gave immense joy to the thousands packed on the sides of the roads. People congratulated one another on their good fortune in being alive and present on such a happy occasion. When they reached the Palace, the women of the inner apartments and the aides and servants of the household came forward and received them with customary rituals, like washing the feet.